, professor of history and Greek at Groningen, was born at Braunfels, in the county of Solras, August 10th, 1604. His father was minister to count de Solms-Braunfels, and Inspector of the churches which belong to that county, and his mother, daughter to John Piscator, a famous professor of divinity at Herborn, in the county of Nassau. He performed his humanity-studies at Herborn, and then studied philosophy at the same place, under Alstedius and Piscator, after which he went to Bremen, where he lived seven years. 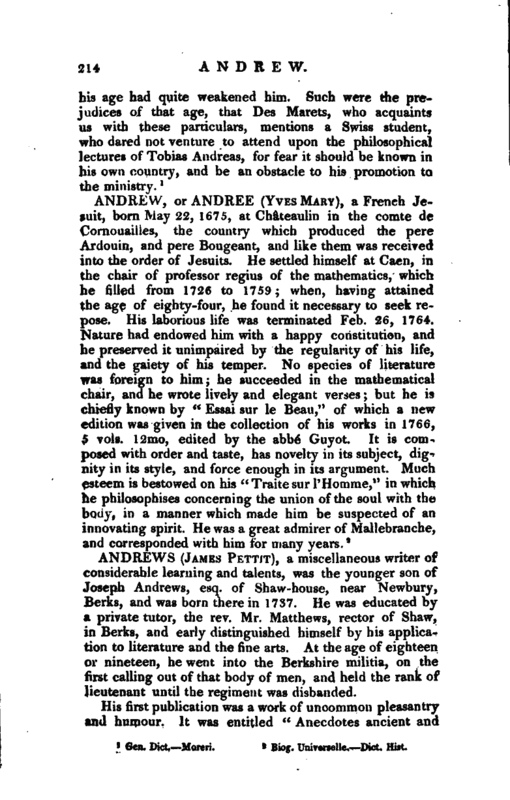 He was one of the most constant auditors of Gerard de Neuville, a physician and a philosopher; and, as he had | a desire to attain a public professorship, he prepared himself for it by several lectures which he read in philosophy. 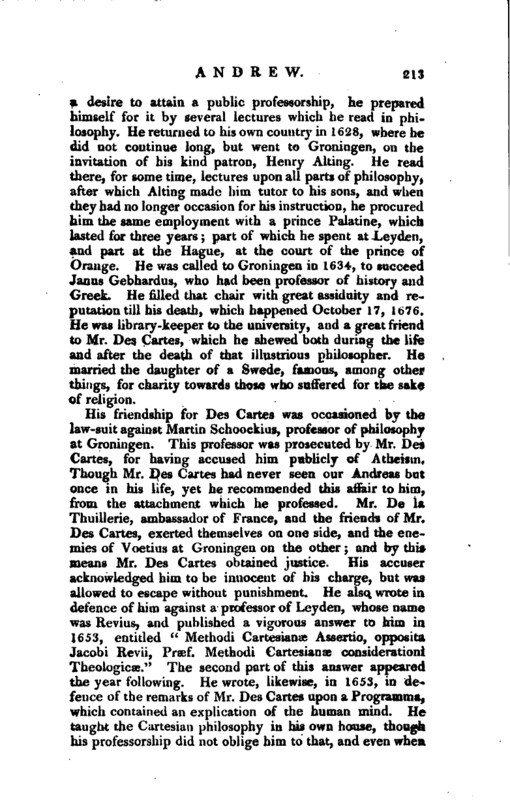 He returned to his own country in 1628, where he did not continue long, but went to Groningen, on the invitation of his kind patron, Henry Alting. 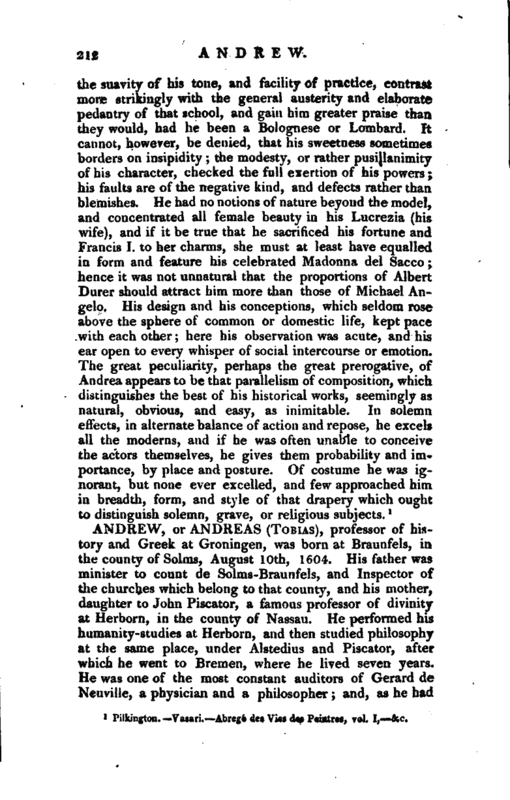 He read there, for some time, lectures upon all parts of philosophy, after which Alting made him tutor to his sons, and wheo they had no longer occasion for his instruction, he procured him the same employment with a prince Palatine, which lasted for three years; part of which he spent at Leyden, and part at the Hague, at the court of the prince of Orange. He was called to Groningen in 1634, to succeed Janus Gebhardus, who had been professor of history and Greek. He filled that chair with great assiduity and reputation till his death, which happened October 17, 1676. He was library -keeper to the university, and a great frierAi to Mr. Des Cartes, which he shewed both during the life and after the death of that illustrious philosopher. He married the daughter of a Swede, famous, among other things, for charity towards those who suffered for the sake of religion.